We set off on a Snowy Saturday morning, stopping at Powell's Books in Portland to stock up on reading material. Calvin's friend, Josh deLacy is on the adventure with us. We had to drag him out of Powell's, but not before he grabbed seven books. 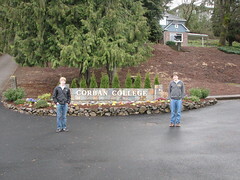 We stopped at both George Fox and Corban colleges. Neither one had any activity, because of spring break; but it was good to walk the grounds. Corban has a disc golf course through the center of campus. Then it was the long haul down to Sacramento, arriving in the late evening. It was good to see my sister Ellen. She, along with Charlie and Princess made us feel right at home.